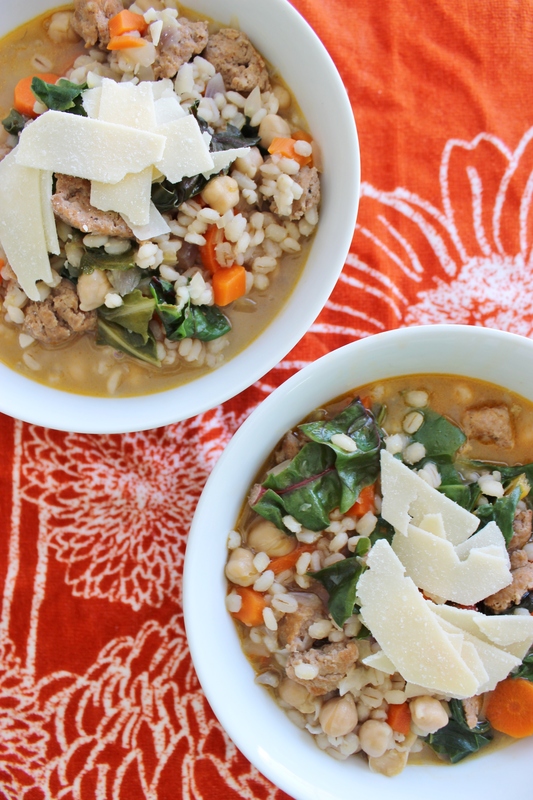 barley soup with turkey sausage, swiss chard, and shaved parmesan. The calendar may say spring, but I’m not buying it. We haven’t quite let go of winter just yet. 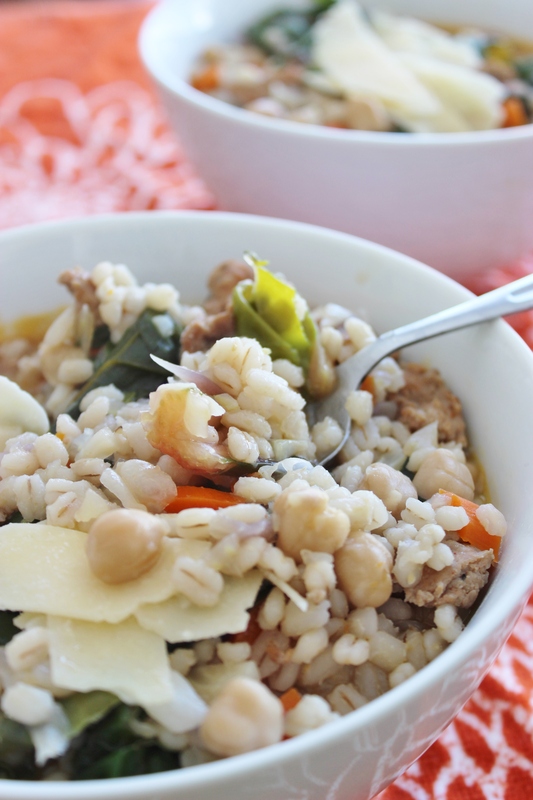 And for these lingering cold days when you’re in need of a hearty, warm lunch or dinner, may I suggest this barley soup? It is good and good for you, simple, and tasty. Top it with some shredded or shaved cheese and serve with some crusty bread. Or just eat it like this. I don’t care. You will like it, I promise. Finely chop your onion, fennel, and carrots. In a large Dutch oven, heat olive oil to medium high heat. Add the turkey sausage, and cook until browned. I let the sausage cook for about 10-12 minutes. Then, add the chopped veggies and saute until soft, 5-6 minutes. Add the barley and red pepper flakes. Cook for about 5 minutes, then add the broth. Bring the pot to a boil, then turn to low heat and let the soup simmer for 35 minutes. Add the chopped chard and rinsed & drained garbanzo beans, and cook for an additional 15 minutes. Remove soup from heat. Serve with a spoonful of shaved Parmesan cheese. Note: This was my first recipe with fennel. It’s been described as having a licorice taste, but I found it to be lightly minty. Once it was chopped, sauteed, and mixed into the soup, I couldn’t even distinguish it. But it’s apparently packed with nutrients: fiber, Vitamin C, antioxidants. Still, if you are leery, or can’t find fennel in your grocery store, just use add more carrots or a finely chopped stalk of celery. Whatever floats your boat will work well in this soup. One last picture because I am new-camera-happy. 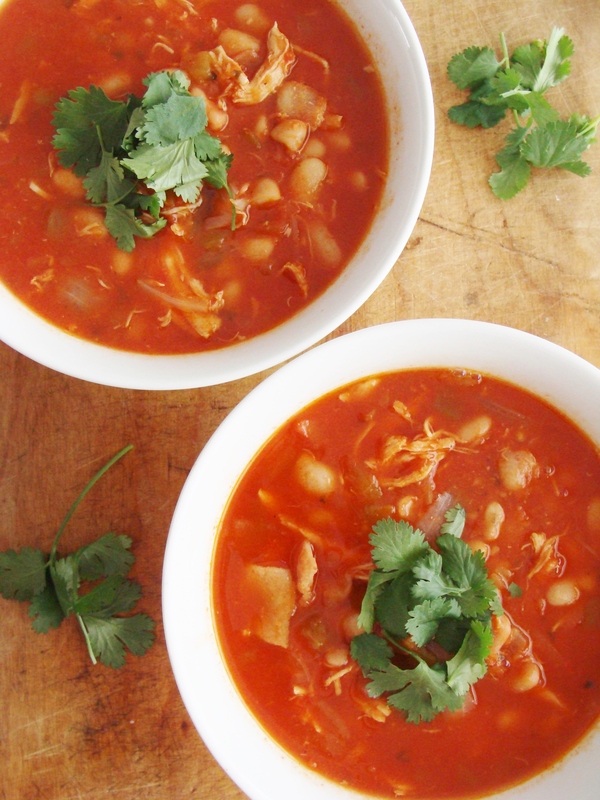 I know I shared a recipe for a white bean chicken chili last month. (It’s excellent.) 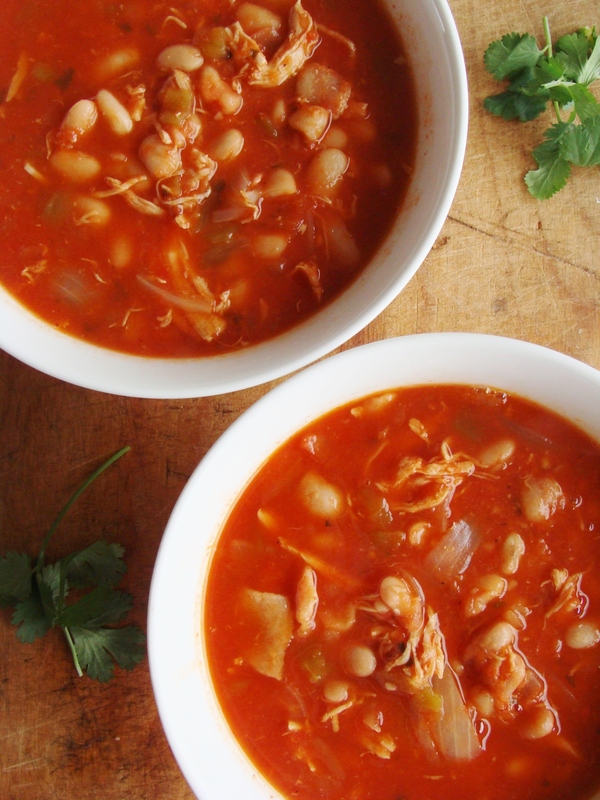 This recipe for smoky chicken chili has a completely different flavor profile. It has a deep, smoky, lingering spiciness, the result of slow cooking the onions and allowing the chicken to absorb the spices. It takes just a little extra time, but it’s definitely worth it. Also, if you don’t have smoked paprika, I highly suggest you get some to use for this recipe. (I know they sell it at Trader Joe’s!) It really makes the difference, and I don’t believe that regular paprika will have the same effect. In a large stockpot, cook the chopped bacon for 3 minutes. Add the chopped onion and garlic to the bacon and continue to cook, stirring frequently, for 30 minutes. The onions should begin to caramelize and brown. Now, add the shredded chicken, smoky paprika, onion powder, garlic powder, and cayenne pepper to the pot. Cook for 10 minutes, stirring and pressing the spices into the chicken with a wooden spoon. This helps to infuse the chicken with flavor. Finally, stir in the chicken broth, diced tomatoes, beans, and green chilis. Allow the chili to come to a slow, rolling boil. Simmer for 20 minutes or so, until the liquid reduces. Top bowls with some shredded mozzarella and fresh cilantro, if you like. I liked this chili just as well without any extra toppings. Enjoy! I hope this makes you feel better about this never-ending winter. It makes me feel better. News flash: It’s still winter. Maybe it was a dream, but this past Saturday I took a long walk with my Mom in near-60 degree sunshine. The strange, glorious warmth was a reminder that Spring is coming. And also that I am really, really pale. It happens. For now, I’m still meandering around the house moaning about how cold I am (“Toughen up!” says Ty), snuggling up in fleece blankets, sipping the occasional (nightly) glass of wine, and making pot fulls of soup and chili. 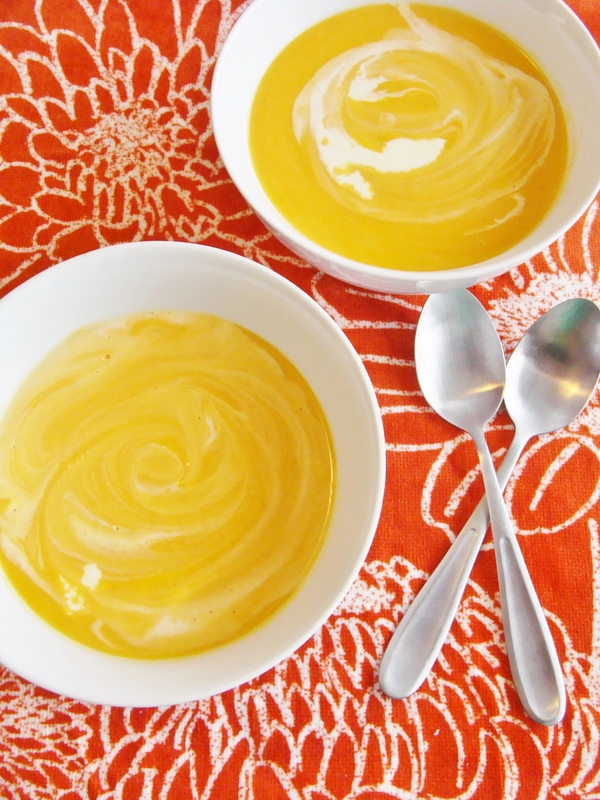 Like this Carrot Coconut Soup! Quick soups like this are the best. 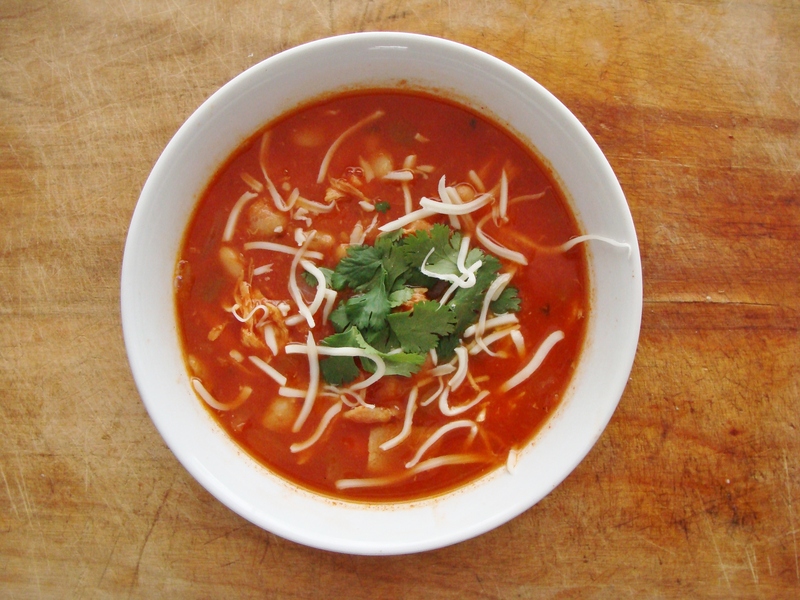 For such a simple soup, it packs a lot of flavor and spicy kick. Also, I love a bright, orange soup! I found this serves 2-3 generously – double if you want leftovers! As always, prep work first! Peel and chop your carrots. Peel and chop your onion. Done! Heat a large saucepan over medium heat. Add the butter and let it melt. Once butter has melted, add the chopped carrots and onion. Season with salt and black pepper. Continue to stir until carrots are softened. This will take about 20 minutes. Now, stir in the chicken broth and coconut milk. Also add the tablespoon of sambal oelek, if desired. Bring the soup to a boil, then reduce the heat and let it simmer for about 45 minutes. Vegetables should become very soft. Remove the soup from heat, then puree with an immersion blender. Serve the soup with a dash of sriracha and cilantro. Note: If you don’t want the soup to be too spicy, but still want some kick, eliminate the sambal oelek. 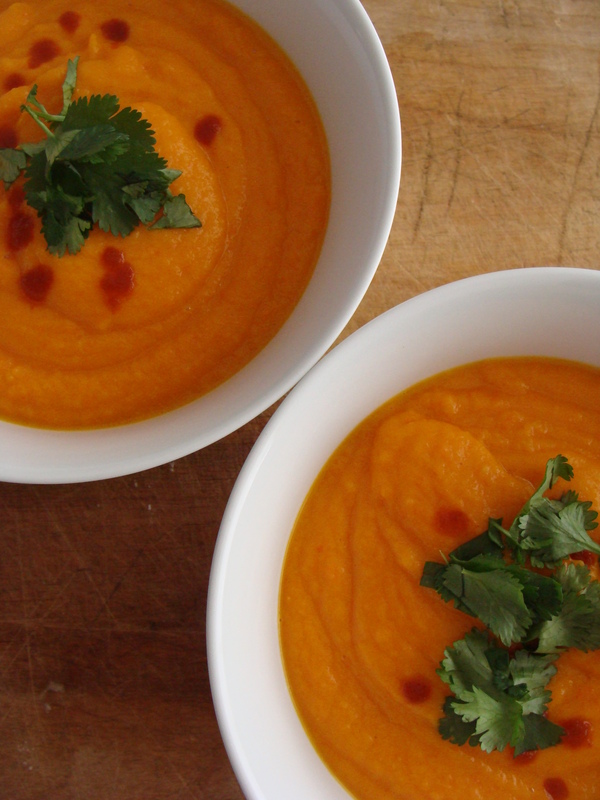 If you want a mild, sweet carrot soup, skip the sambal oelek and sriracha altogether. 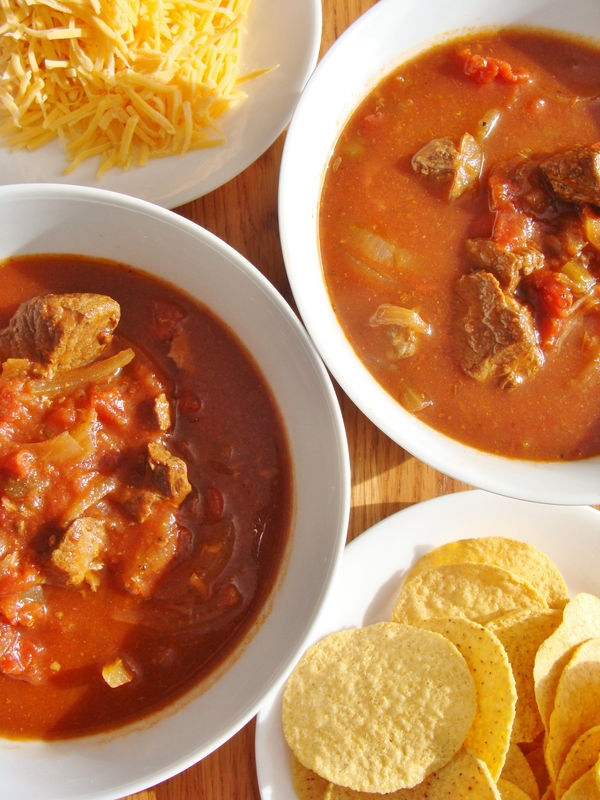 slow cooker Big Red soup. I am not a Nebraska Cornhusker, aka a “Big Red” fan. I am 100% a Ohio State Buckeye (and a Kent State Golden Flash every now and then because of my fiancé.) But I sure do love this Big Red Soup. 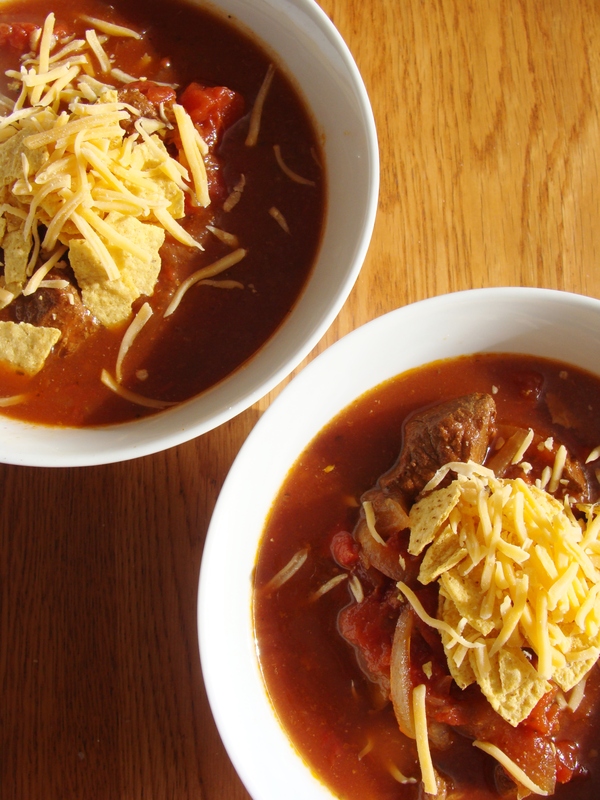 The soup may be named for a Nebraska football team, but spoiler alert: It’s just a simple, tasty slow cooker soup that will keep well in the fridge all week long. Drizzle your olive oil in a large skillet over medium high heat. Cook the beef until it’s browned on the outside. Then, put the beef in the bottom of your slow cooker. Add all of the additional ingredients, except for the chips and cheese. 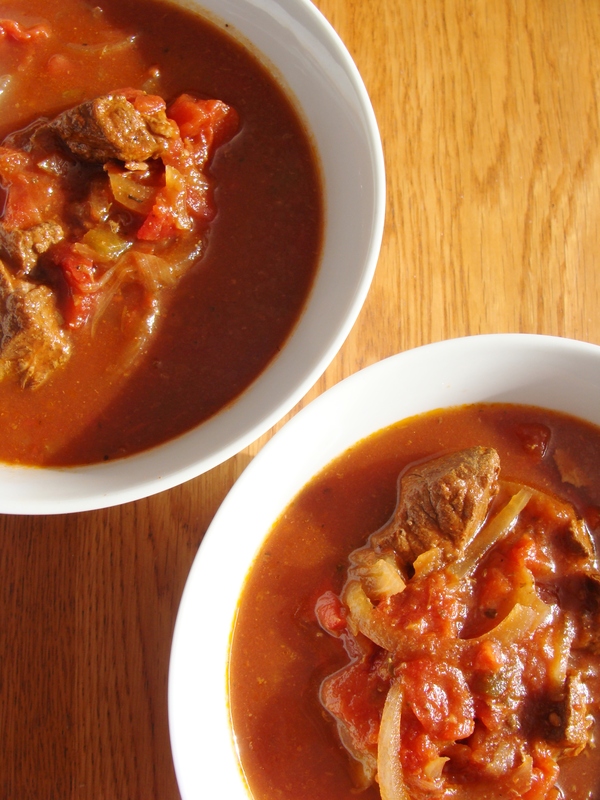 Let the soup cook on low for 8-10 hours, until the beef is tender. Ladle the soup in bowls. Top with crushed tortilla chips and shredded cheddar cheese, if you like. 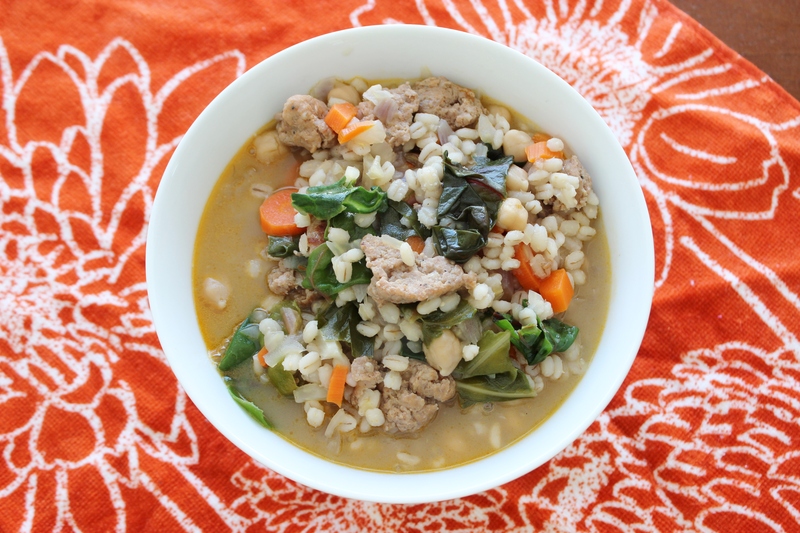 Folks, I just have one more meatball-related recipe for you – Italian wedding soup! When I was a kid, I thought this was a soup that Italian people ate at weddings. Seems logical, right? 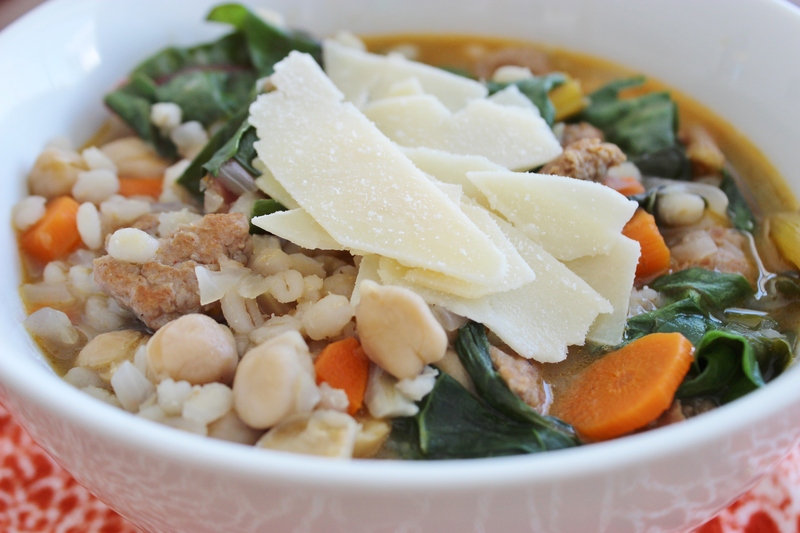 Well I just Googled wedding soup and learned that “wedding soup” actually means “married soup”—referring to the marrying of the flavors of green vegetables and meat. Now you know. 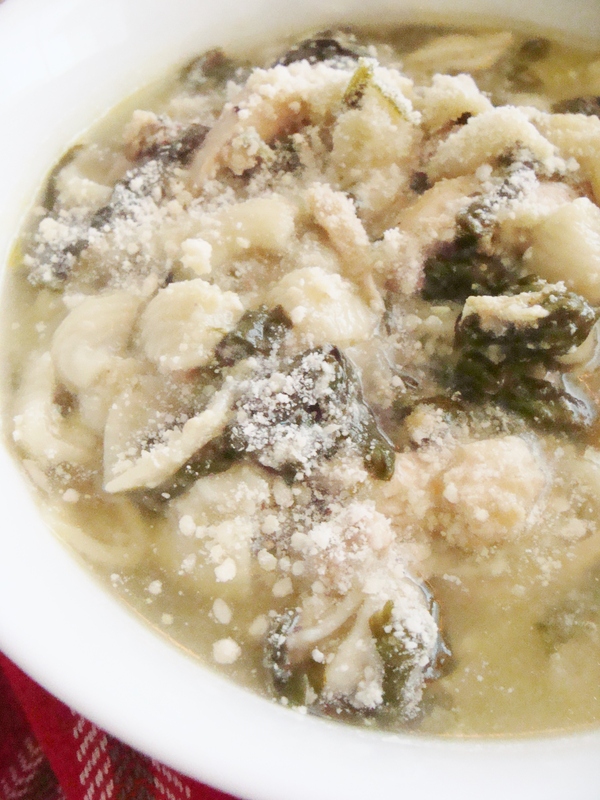 Typically, this soup contains some sort of green leafy vegetable, such as escarole or spinach or curly endive, and meat – usually a small meatball made of beef and pork, cooked in a chicken broth. 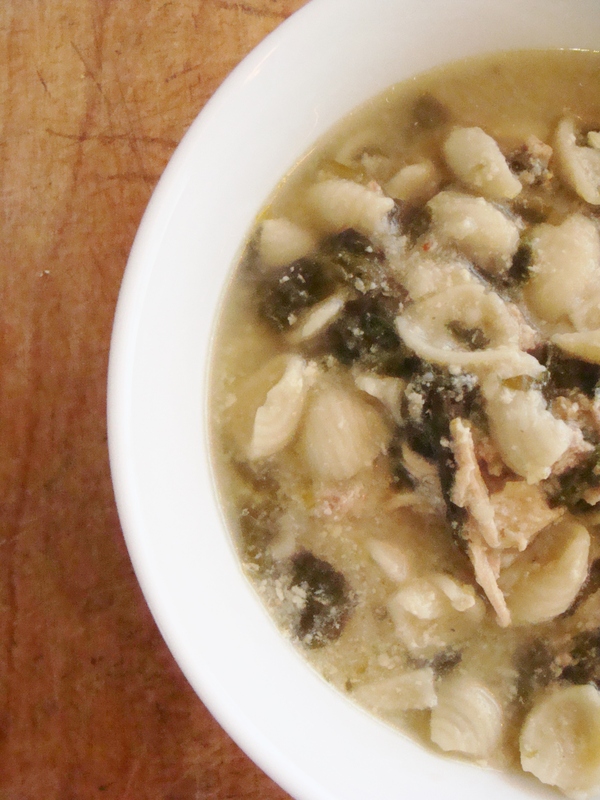 Chances are, you’ve had this soup before. You’ve probably had several varieties. For this soup, I used my own Italian meatball recipe. 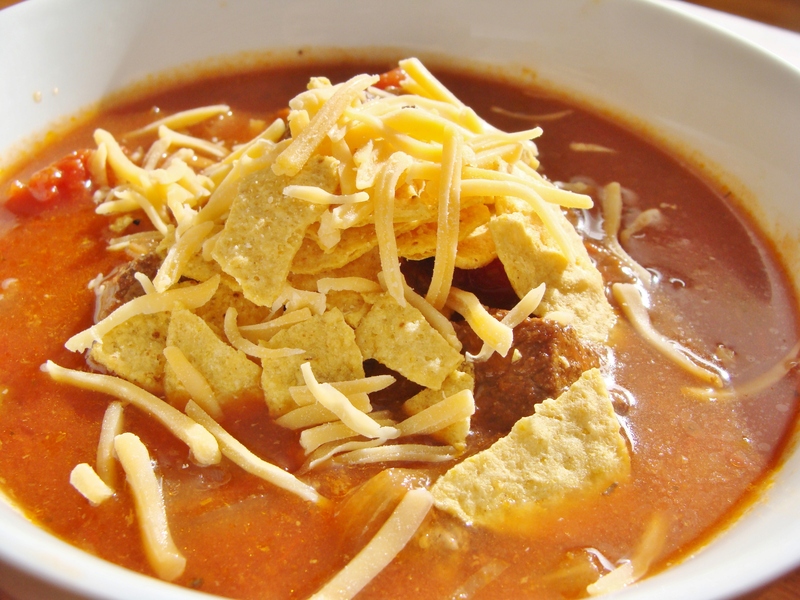 I rolled smaller meatballs with this soup in mind, but you could totally cut larger meatballs in half or quarters. Otherwise, I loosely followed Giada de Laurentiis’s recipe, with some minor changes and some additions to make the soup more hearty. This girl needs sustenance! 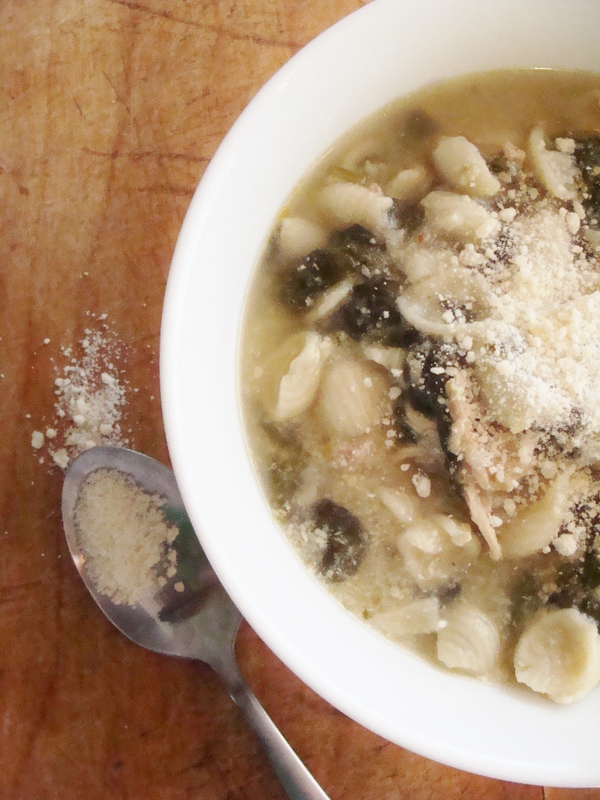 A quick note: You can really play with the ingredients of this soup. Add as many meatballs or as much shredded chicken or as much pasta as you like, etc. You get the idea! If your meatballs are not already prepared, make them! Otherwise, make sure you have the cooked meatballs ready to go. If using meatballs that were previously frozen, I suggest defrosting them before adding to the soup. Also cook and shred your chicken breast. Bring the chicken broth to a boil in a large stockpot over medium heat. Season the broth with the dried basil, salt, ground black pepper, and dried oregano, or an Italian seasoning blend of your choice. Add 2 cups of small shells to the pasta and boil for 8 minutes, until pasta is tender. Now add the meatballs and the chopped spinach to the broth. Cook for 5 minutes, then lower the soup to a simmer. In a medium bowl, whisk the eggs and the Parmesan cheese until blended. 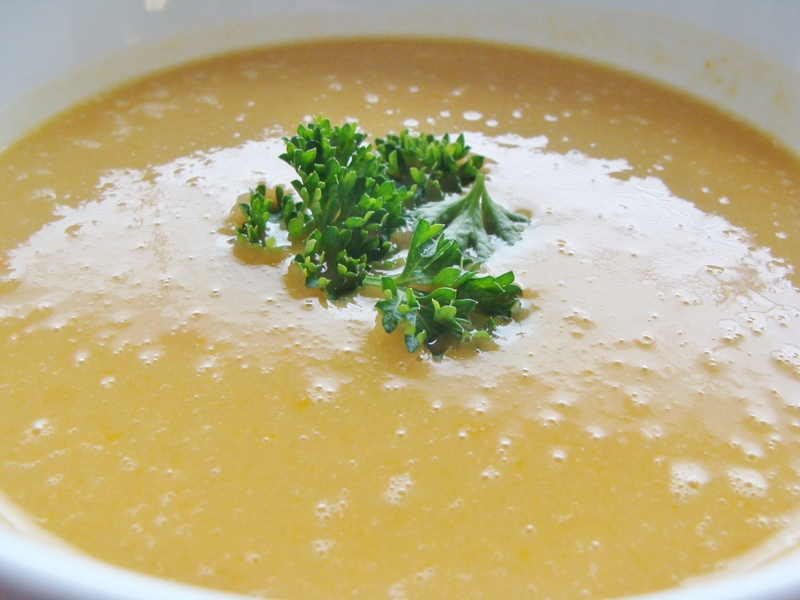 Slowly drizzle the egg mixture into the soup, while continuously stirring the soup in a circular motion. By stirring gently, you will form thin strands of egg in the broth. This should take about 1-2 minutes. Add the shredded chicken and stir well. Taste the soup, and season with additional salt and pepper as needed. 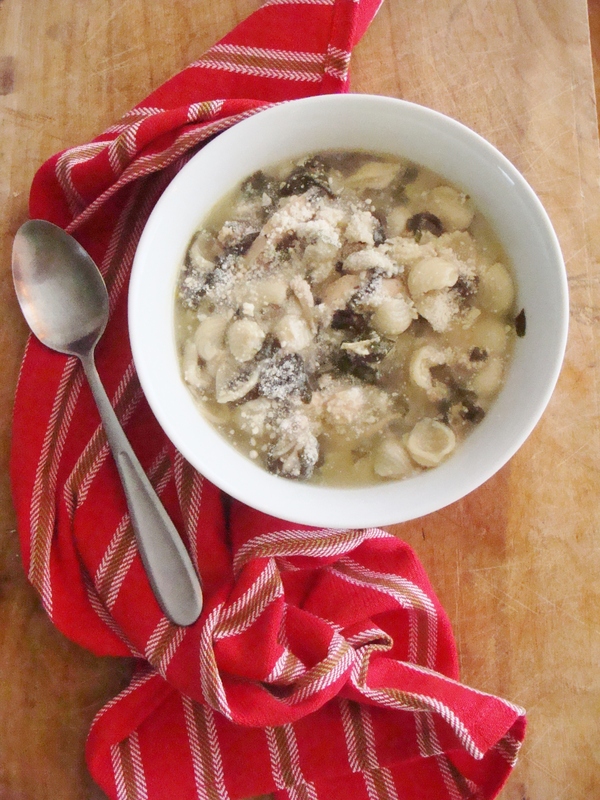 Serve in bowls topped with a sprinkling of Parmesan cheese. Note: Don’t be alarmed if your meatballs crumble while simmering. Mine became so tender that they broke apart easily while I stirred the soup. This is a good thing! In the midst of all the cookies and boxes of chocolates and holiday parties this month, I give you a soup that is warm and hearty and healthy. This white bean soup is so inexpensive and easy to make that I’ve prepared it three times in the last month. If you’re looking for a healthy, simple dinner recipe, this is for you. Prepare your veggies! Dice your onion and celery, and peel and dice your carrots. Peel and chop that garlic! Now you’re ready to go. Also be sure to drain and rinse your cannellini beans. Heat olive oil over medium heat in a large soup pot. Add the diced onions and cook until translucent, 5-7 minutes. Add the diced celery and carrot and continue to cook, 10 minutes or until they have softened. Then add the chopped garlic and bay leaf*. Continue to cook for several minutes. Pour the chicken broth into the pot, as well as your beans and a sprinkling of salt and black pepper. Bring the soup to a boil over medium high heat. Once soup comes to a boil, lower the heat and let soup simmer. Cook uncovered for 45 minutes to an hour—vegetables should be completely soft. Remove the bay leaf from the soup, and puree the soup—I used my immersion blender. Stir in lemon juice and add more salt and pepper, to taste. 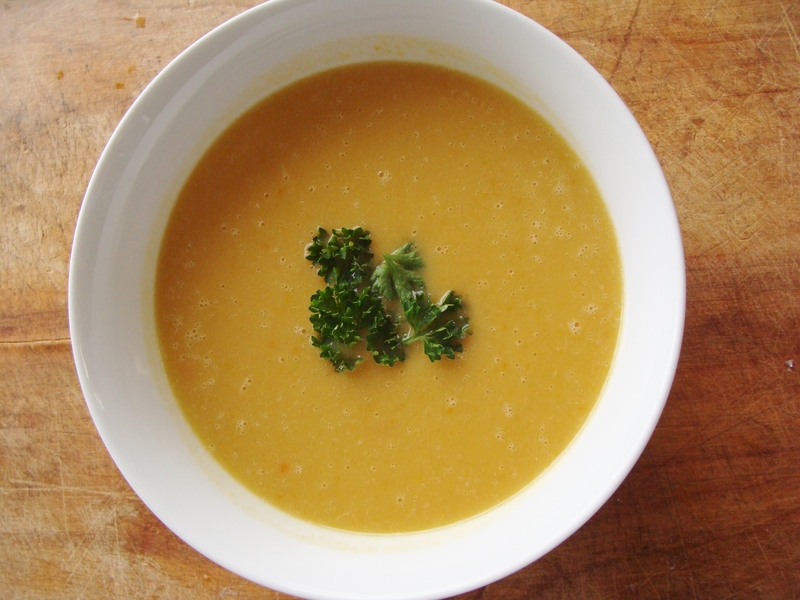 Serve soup in bowls with some crusty buttered bread. *Note: The original recipe calls for 4 sage leaves to be added with the garlic and bay leaf—my grocery store was out of sage the first time I made this soup, so I made it without. This soup manages to be creamy without any cream or butter! So good. 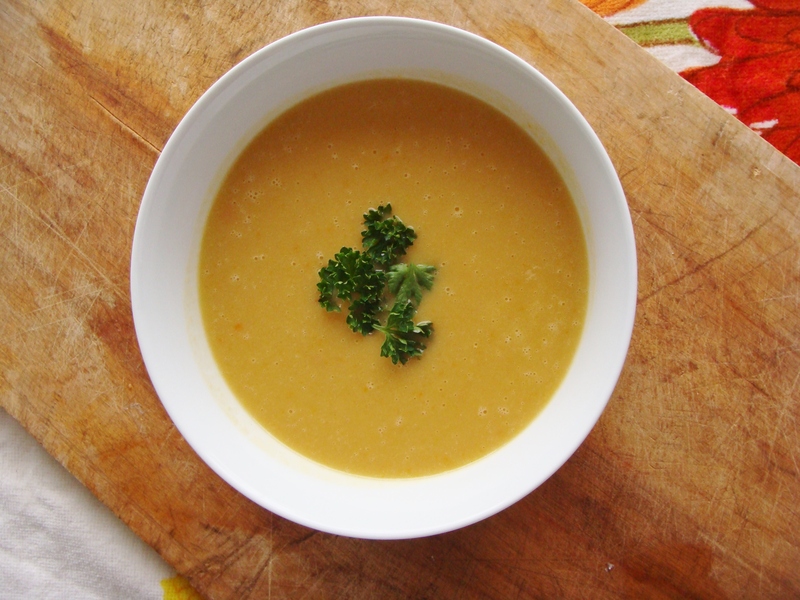 I have made this butternut squash soup recipe so many times and could still eat it practically every other day. It just has the best flavor and is so sweet and satisfying, especially in the fall. I think the sherry is the secret ingredient. P.S. This soup is totally worth the effort to peel and seed and chop up a large squash. P.P.S. 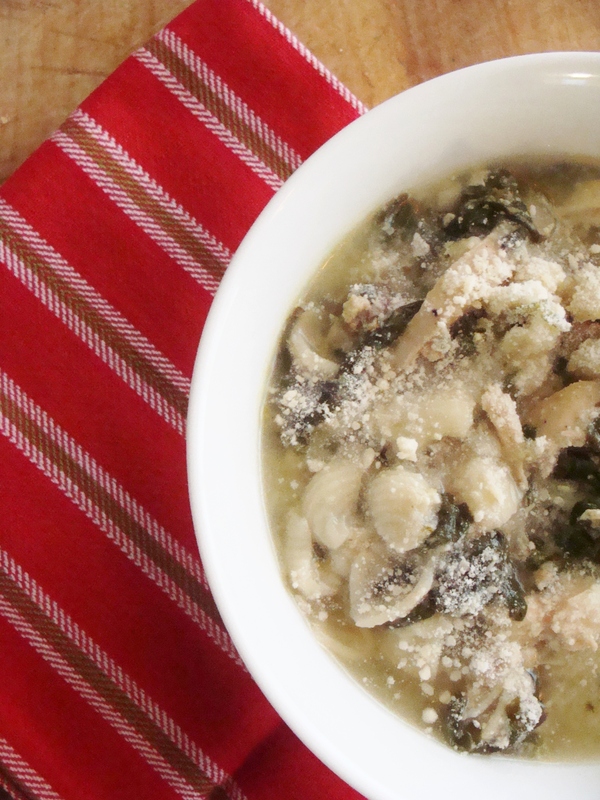 This soup will make your house smell very, very yummy. Heat a large non-stick soup pot over medium heat. Add your butter and olive oil and heat until butter is melted. Then add your chopped onions, cooking until soft–about 5 minutes. Add your garlic and saute for one minute. Now add your chopped squash cubes. Saute for 5 minutes, then pour in your broth and sherry. Add a dash of cayenne pepper. Bring pot to a boil then cover and simmer on low for 25 minutes. 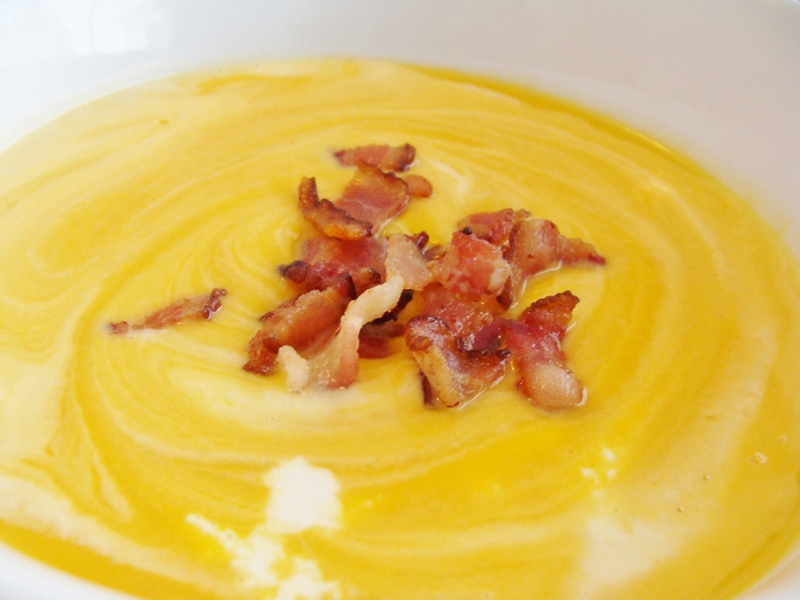 While your soup is simmering, you can cook your bacon. 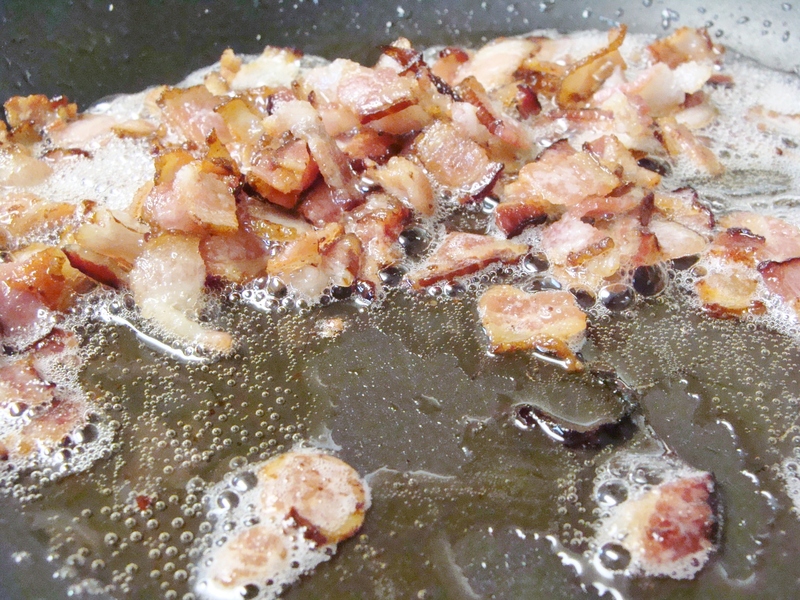 Drain the bacon on a paper towel to remove excess grease. I can’t resist a photo of simmering bacon bits. Can you? 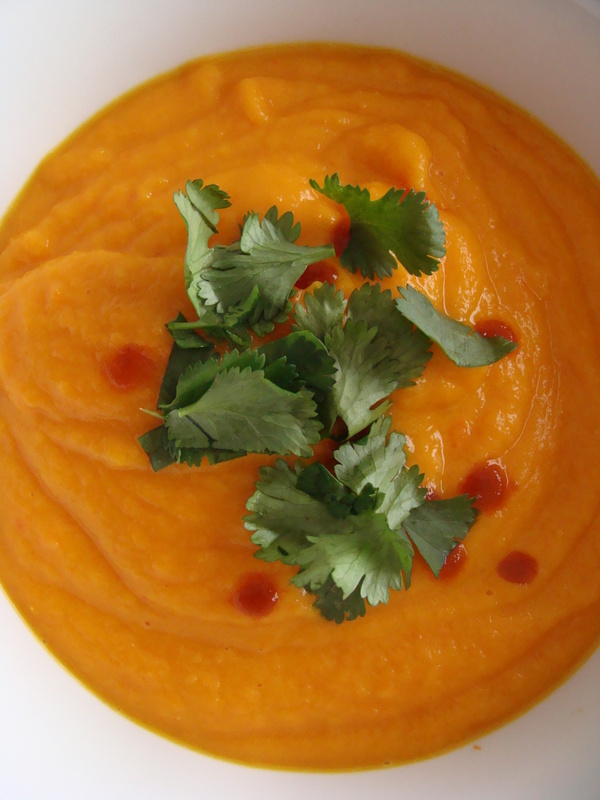 Puree the soup by transferring it into a blender or using an immersion blender in the pot. Stir in the cream after pureeing, and season soup with a dash of sea salt and black pepper. 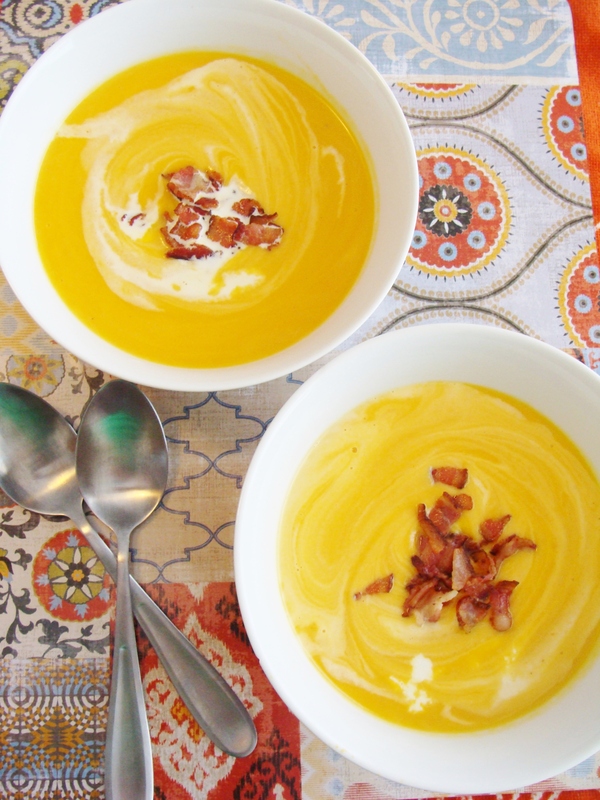 Soup can be served with or without the bacon bits. I vote WITH! You are currently browsing the soups. category at The Cheesy Kitchen.